Sue has been in practice since 1990 and is a registered member of The Society of Homeopaths. She was initially drawn to homeopathy in the early 1980’s after experiencing its excellent results with her own children’s ear infections. This led her to train to become a professional homeopath. Sue treats a vast range of conditions in men, women and children with a particular interest in fertility cases. An experienced Registered Homeopath and lecturer, Sue is in full time homeopathic practice working in clinics in Eye (Suffolk) and Norwich. Sue is Co-Director of the busy Complementary Medicine Centre in Eye, a private clinic set within a NHS hospital. 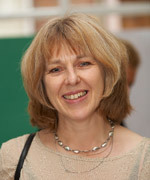 Sue is vice principal of The Homeopathic College of East Anglia where she teaches regularly. She has also lectured throughout England for UEA, University of Manchester, the Society of Homeopaths and Foresight. Sue Saunders is a licentiate of The British School of Homeopathy and a member of The Society of Homeopaths – the biggest professional registering body of Homeopaths in the UK. These fees include prescribed homeopathic remedies. You may be entitled to a refund of these fees through your private health insurance. Sue works from The Complementary Health Care Clinic every Thursday, and supervises a student clinic one Saturday morning per month at The Homeopathic College of East Anglia. She is also available for appointments at the Complementary Medicine Centre, based at Hartismere Hospital in Eye – please contact this centre directly for more information.